Canada Goose has recruited Inuit craftworkers for its latest collection, as part of a new social entrepreneurship initiative. Dubbed ‘Project Atigi,' the collection features a unique series of bespoke outerwear pieces created by expert seamstresses from nine different communities in the Inuit regions of Inuvialuit, Nunatsiavut, Nunavut, and Nunavik in Northern Canada. 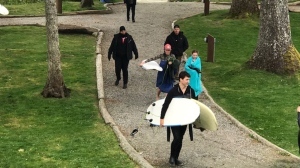 The 14 textile workers have utilized their traditional clothing design skills to create anoraks, parkas and amauti-esque jackets, using Canada Goose materials. The line launches this month, and spans menswear, womenswear and childrenswear. 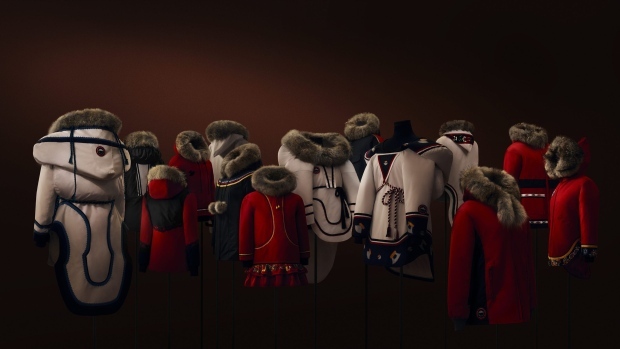 The collection -- which pays homage to the fact that the iconic parka has its origins in Inuit culture -- will also feature traditional artistic embellishments and patterns. All sales proceeds will be directed to the Canadian Inuit organization Inuit Tapiriit Kanatami. "Canada Goose was built in the North and we have a responsibility to be a meaningful part of the community that we call home," said Dani Reiss, President and CEO of Canada Goose, in a statement. "For more than 10 years, Arctic stewardship has been woven into the fabric of our business and Project Atigi is our way of leveraging our entrepreneurial success to expand theirs." The luxury outdoors brand has a longstanding history of supporting the northern region; it has previously donated extensive amounts of materials to Arctic communities over the last 10 years as part of its Resource Centre Program, and forged a partnership with Polar Bears International (PBI), a non-profit organization dedicated to the preservation of polar bears and their habitats.